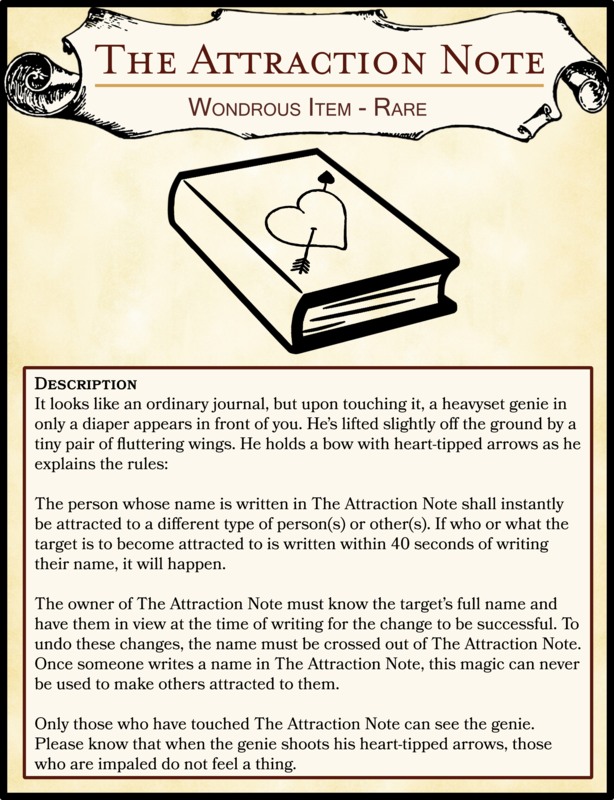 The person whose name is written in The Attraction Note shall instantly be attracted to a different type of person(s) or other(s). If who or what the target is to become attracted to is written within 40 seconds of writing their name, it will happen. The owner of The Attraction Note must know the target’s full name and have them in view at the time of writing for the change to be successful. To undo these changes, the name must be crossed out of The Attraction Note. Once someone writes a name in The Attraction Note, this magic can never be used to make others attracted to them. Only those who have touched The Attraction Note can see the genie. Please know that when the genie shoots his heart-tipped arrows, those who are impaled do not feel a thing.